Ideal for staying organised on the move, the Dell Axim X51 PDA provides performance, connectivity and business-essential functionality in a sleek and elegant design. 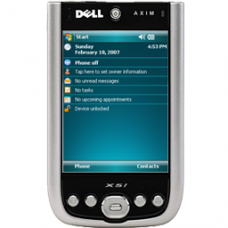 With the powerful Intel XScale PXA270 416MHz Processor, 64 MB SDRAM and 128 MB Flash ROM, the Dell Axim X51 handheld delivers seamless performance with your applications and software. * Integrated Bluetooth wireless technology for wireless communication with other Bluetooth devices. * Secure Digital (SDIO) and Compact Flash Type II slots for greater storage and expansion capabilities. * 3.5 inch QVGA display, you can view documents and interact with your device with crystal clarity.